Temple Ewell Primary in Dover has achieved IQM Flagship School status. A lot of developmental work has taken place in the last year since the Year 2 COE review. The school moves from strength to strength with excellent outcomes year on year for its pupils. An outstanding OFSTED inspection has been a thoroughly deserved and important feature of the past year. During this year the school has been able to further develop its very important and extensive work to support other schools within its local alliance and with the schools in its academy group. The school has also continued to develop its excellent partnership work with parents. The training staff received as part of the Aquila Academy Group on the Achievement for All, (AFA) programme, which enables staff to have structured conversations with parents in order to help them to support their children’s learning at home, has proved to be very beneficial with staff feeding back that they find the approach helpful in their discussions with all parents. Teachers have met with the targeted parents at regular intervals on a 1-1 basis throughout the year to discuss ways of helping their children and to agree targets to be tried at home. Outcomes have been very positive with almost 90% of targeted parents engaging with the scheme and trust between staff and parents has grown. As a result, some parents have become more open in expressing their concerns and have, in some cases, begun to engage with external agencies. In addition, this year the school has further developed opportunities for parents of children with SEND to receive support from the school and from their peers. The parents themselves helped to develop the ‘inclusion breakfasts’, which were introduced on a termly basis but are so popular that they now take place monthly. There is a core group of parents who attend regularly with others attending as and when they are able. A number of staff also attend regularly in addition to the Inclusion Manager/SENCO. These include the nurture group leader, the sports’ coach, TAs and SLT members along with the Inclusion Governor. The Inclusion Manager arranges external speakers to come to the meetings on occasions,. The meetings have been very successful because of the trust that has been built between staff and parents and the opportunities it provides for parents to share their worries, concerns and to find support and get helpful suggestions. There was a genuine buzz of enthusiasm in the conversations taking place and all concerned clearly value these events. The parents I spoke to could not speak more highly of the support they have received from the school and they highlighted the school’s support on transition to secondary school and the school’s willingness to listen and to take swift action to address any concerns parents may have about their children. The school has also continued to provide workshops for parents on a variety of issues and subjects. Every class has a termly session where parents are invited into class to see learning in action. A subject leader meets the parents first to ensure they know what to look for when they go into the classroom. This model is proving very successful and each class teacher has to offer the sessions twice in order to enable all the parents to attend. This year parents suggested that the school adopts a Twitter page, this has been done and they are finding it a very useful form of communication with the school. The Inclusion Manager, for example, uses Twitter to signpost organisations that can support parents of children with SEND and to highlight events such as the autism dress up day. The Inclusion Governor spoke very highly of the school’s work with children and families. With a social work background herself she has the skills and experience needed to provide appropriate support and challenge to the school and she has played an important role since she became the inclusion link in the last year. She mentioned the excellent work of the school in providing extensive support for the most in need children and families. She also highlighted the work of the sports’ coach who has, for example, managed to get a child who lacked confidence and motivation to be very proud of his achievements. Learning walks with the Inclusion Manager of all classrooms once again highlighted the wonderful teamwork of teaching and support staff and the excellent relationships they have with the children. The school has continued to develop its Growth Mindset approach, this is evident in the positive learning attitudes and the positive approach of all staff. 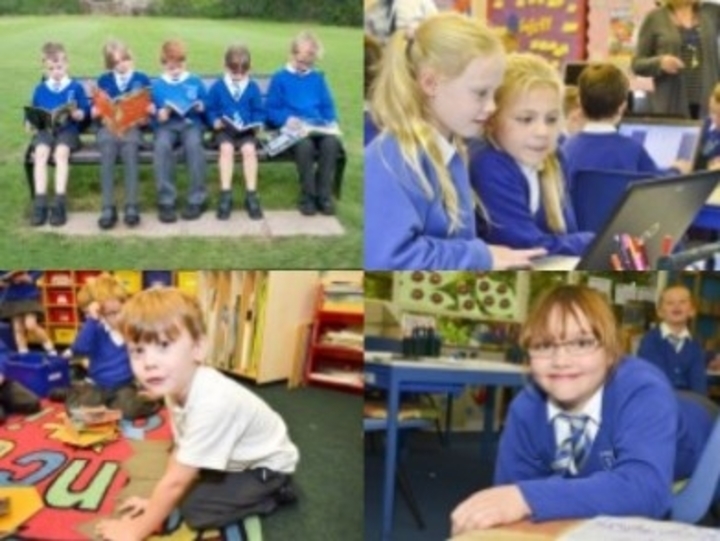 The atmosphere throughout the school is very friendly and encouraging: children were enjoying their learning and all pupils were completely engaged in every lesson, which is a mark of the outstanding work of teaching and support staff. Lessons visited were exciting and challenging for everyone with interesting and imaginative activities planned for pupils. Behaviour was superb and there was an informal, family atmosphere with children cooperating fully with each other and with staff. Staff find many different ways to encourage, support and challenge the children. Features of lessons visited on the day included excellent interaction between pupils and between staff and pupils; the use of modelling by staff to help pupils to give feedback on each other’s work; pupils producing superb written work based around a picture; the use of ICT to support learning; excellent support from Teaching Assistants to ensure their children with SEND are fully engaged in the lessons and are developing their skills and self-confidence; a teacher encouraging children to stay on the carpet and talk to her if they need more help; a teacher leading a group and providing excellent maths input using a white board to explain the work to a group of children with a variety of needs and with all children targeted fully engrossed in the task. One teacher has recently introduced Singapore maths techniques to her class following training, she and they were clearly enjoying the activities she had planned for them. The reception teacher has introduced a very interesting model of involving a small number of children each week in lesson planning and this is having a very positive impact with all children thoroughly engaged in the different activities available. A nurture group, ably led by a member of support staff provides a very secure nurturing environment for targeted children who are able to develop their self-confidence and social skills in a small group setting. It was very interesting to speak to the 2 pupils who were in the group at the time of my visit. They explained the reasons why they were there and the help it has given them in improving their behaviour and attitudes in class. The atmosphere throughout the school was very friendly, calm and industrious with all children focused on the tasks in hand and all engaged in purposeful learning. Staff should be congratulated on their excellent and encouraging work in all classes and it is not surprising that several members of staff are now disseminating their superb practice to staff in other schools. Teaching and support staff are valued for their skills and they are helped to further develop their expertise and reflective practice through excellent CPD. Developments are introduced across the school to ensure staff are equipped to deal with the diverse needs of pupils in their classes. This year this has included the introduction of a new format for CPD with teachers working in pairs to plan, teach and review together based on the John Hattie model. This is proving positive in its first year and teachers will be encouraged to be innovative in this work in the coming year with outcomes disseminated to the head teacher. The significant numbers of pupils with SEND continue to receive excellent support from Teaching Assistants and other support staff. The Inclusion Manager is rigorous in ensuring that ongoing training takes place to ensure staff are equipped to deal with the needs of all children in the school and she continues to meet with them regularly to ensure their training and development needs are met. It is a school that is always learning and developing its areas of expertise according to its pupils’ needs. The school continues to be very outward looking and its work with its partner academy schools and with the other local schools is extensive. The school is now playing a leading role in supporting these schools with several staff being involved in this work, for example, the nurture group leader, the sports’ coach, as well as the Inclusion Manager and members of teaching staff. They provide support on many issues, including moderation, subject expertise and various aspects of inclusion. This enables good practice to be developed and shared by the schools and it also means that staff at all levels are able to develop their skills and expertise. The Inclusion Manager has continued to support two other schools every week to develop their SEND work and other inclusive practices. She has made a significant impact and the Headteacher of one of the schools has described her superb support, “Her SEND expertise and knowledge is second to none as is her passion for improving outcomes for these pupils”. This is a mark of the superb work on inclusion at this school led by the Headteacher and the Inclusion Manager. Exceptional features of this school include the overall ethos of supporting and developing the abilities and talents of all children with a clear focus on meeting individual needs; the superb work with vulnerable families; the exceptional support for pupils with SEND; the excellent teamwork, expertise and commitment to children and families shown by all staff and the excellent ongoing support to other schools being provided by several members of staff on a range of issues.